Some time ago Anthony Watts opened his website to what purported to be a ‘great debate’ on climate science, between William Happer, emeritus professor of physics at Princeton and very recently an adviser to President Trump (Professor Happer and I have corresponded from time to time), and David Karoly, a professor at Melbourne University who has been involved in a number of IPCC reports. I had a particular interest in this debate, because I had debated Professor Karoly myself, some years ago. Apart from saying that there was a lot in what I said that he would agree with, Professor Karoly ignored the substance of my criticisms of the orthodox AGW position and put forward his own views. As opening speakers he and I were not allowed rights of reply, so I remained frustrated throughout the evening. How do we know that the increase in CO2and other greenhouse gases in the atmosphere have caused most of the recent global warming? How do we know global warming and more CO2will have substantial adverse impacts on humans and the planet? The debate, or at least Andy May’s arrangement of it, is continuing. The questions are old ones, but at least they are central. What I am writing about here are the retrieved views of both scientists about the six questions. Question 1 Is recent global warming unusual? Both Karoly and Mann agree that climate changes, that the world has become warmer over the past 150 years, that adding CO2 to the atmosphere will increase warming, and that warming is continuing at approximately 2ppm per year. Where do they disagree? 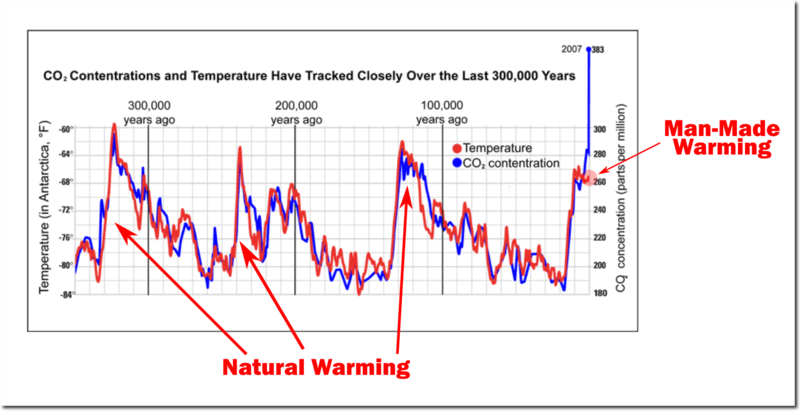 Karoly asserts that there has been no comparable warming in the last thousand years, and his evidence is largely that of the Mann hockey-stick. Happer points out that the Mann hockey-stick has been eviscerated by experts on technical grounds, and that the IPCC itself dropped it from later Assessment Reports (the diagram figured prominently in the Third AR). At once we have a problem, because if you accept the Mann hockey-stick at all it is hard to know what to say in response to such acceptance, other than to ask how the speaker deals with the Wegman, McIntyre and other analyses of the Mann methodology, which were destructive in the extreme. What is perhaps more awkward still is that we will never know what the ‘real’ temperatures were between 1000 AD and the beginning of widespread thermometer use in the late 19th century. The proxies that have been used, in what seems to me a desperate attempt to find a human influence signal, just aren’t accurate (fine) enough. We just don’t know, and we probably will never know; and that is really irritating. May provides lots of evidence, and comes to the conclusion that while we know something about the Northern Hemisphere, we know next to nothing about the Southern, and cannot therefore either say that the world was warmer during the Mediaeval Warm Period or that it wasn’t. And of course a great deal hangs on this issue. Is recent global warming unusual? On the evidence it is really hard to come down strongly one way or the other. My own tentative view is that it isn’t unusual, but I would welcome offered argument and evidence the other way, especially that dealing with the climate sensitivity question. Question 2: How do we know that excess CO2 and other greenhouse gases are the result of human activity? Karoly provides an argument, based on the ratio of carbon isotopes, that there has been no level of CO2 in the last 800,000 years that is greater than 300 ppm, until you get to the 20thcentury. Happer accepts that the observed increase is indeed the work of human beings. I would like to say ‘largely the work’, but with uncertainty. Question 3: How much of the global warming has been due to human activity? David Karoly’s central position is that ‘an overwhelming consensus of climate scientists agree that it[is]’, that it will continue, and that bad things will happen as a result. His subsidiary point is that climate models show it must be so. I have no truck with ‘the consensus’ as a source of authority. We were taught that as undergraduates. They are there to be overturned in time — or confirmed over time through the lack of effective criticism (Popper’s use of falsification). The trouble is that the supposed consensus has not been confirmed over the last thirty years, as I pointed out above. It remains an assertion. It’s not even correct, anyway. There is no consensus about how much human beings have contributed to recent global warming, for climate scientist have never been asked that direct question, and his quoted passage above is not one that contains any number. Nor can we place much faith in what climate models tell us. They haven’t got things right even when they have the data they need. As has been argued again and again, they start with the assumption that CO2 is the main cause, and Lo! they find that it must be. Happer relies on the evidence that, setting aside the last million years, the rest of the earth’s history shows CO2 at much higher levels than at present, which is one of carbon dioxide starvation. Ergo, high CO2 has natural causes. My summary is that no one knows, and all we can say is that human activity has added to the recent warmth — by how much we don’t know. There are as many estimates as there are estimators. Question 4: How accurate are climate models? The canary in the coal-mine for many sceptics is that computer models don’t capture the similar warmings from 1910 to 1945 and from 1975 to 1998, let alone the lack of warming from 2000 to 2012, when CO2 simply kept rising but temperature didn’t. For Karoly these inadequacies are acceptable, for Happer they are not. He explains why (and I agree with his reasons), and he sticks to what he calls ‘real’ measurements — satellite images, ocean pH, real records of extreme weather, and so on. As regular readers will know, that is my position too. Climate models provide useful information, but they don’t provide real data. You have to measure real events and processes to obtain them. Question 5: Why will increasing CO2 have an adverse effect on humans and the planet? This is a question that has fascinated me from the beginning of my interest in the issue, for all the obvious reasons. Warm is outstandingly better than cold, for nearly all living things, nearly all the time. Karoly says the adverse effects are already happening, and will continue. His evidence is disputed by many others who look hard at real data, like Pielke Jnr. I don’t think there is any evidence that there have been adverse effects, and I’d be surprise to hear that there are, with real data to back them up. All the evidence os that there warming so far has been beneficial. Karoly sees the oceans becoming more acidic, to the decline of marine species and much else. He does accept that ‘moderate levels of global warming’ may have some benefits, but he plainly thinks that we will rocket past moderate levels, and then everything will be dire. Happer thinks that this level of alarm is exaggerated because, to repeat, the planet is and has been for a long time in a ‘CO2 famine’. More, there was never any tipping point or runaway episode in the earth’s history when high levels of CO2 led to some catastrophe — at least there is no evidence of such an event. And the ocean acidification debate continues, neither side happy with the science of the other. The oceans are vast, and we know far too little about what happens within them and across them. Question 6: What should we do, if anything to combat global warming? It is easy to spot the differences here. Karoly says that we have to stabilise greenhouse gases in the atmosphere. His case rests on a climate sensitivity (ECS) producing three degrees C of global temperature for each doubling of CO2. So there is nothing new here, because that is his general explanation for the catastrophe awaiting us with global warming. Happer sees ECS at about one degree, which is what you would expect from the physics if there were no such thing as climate sensitivity. Indeed, to make the point again, without ‘climate sensitivity’ there would no AGW issue at all. The trouble is, no one has been able to locate and measure this fabulous creature. Happer goes further, and provides a graph to show that it will take around two hundred years to reach a doubling of current CO2 levels. It is not clear to me that we in 2018 have any kind of responsibility to shield our eighth-and-later generation descendants from supposed harm from global warming perceived two hundred years ago. More than fifty explanations have been proposed to explain why model runs offer such poor performance. The most sensible one I rehearsed earlier. They run too hot because they accept ‘climate sensitivity’ at a high level. If you run them without CS, as the Russian model does (and it fits well the real-world data) the case for catastrophe and for government interventions, both nationally and internationally, simply falls away altogether. That is Happer’s position. It is mine too, and after ten years of study of this issue I see no reason to change it. There is a lot of material in this ‘debate’, though I wouldn’t call it a ‘great debate’ since the outcome required someone else to orchestrate the discussion, but I recommend it to those readers for whom this whole subject remains of continuing interest. Answer: nothing. Because any global warming we could get in the foreseable future (e.g. this century) would be net beneficial . That is, the positive impacts would exceed the negative impacts globally. This is the critical point that should be the subject of discussion, not endless arguments bout climate science. Simple statements like that are a form of denialism. Scientists have explored the CO2 fertilisation effect and run trials. “Scientists have observed the CO2 fertilization effect in natural ecosystems, including in a series of trials conducted over the past couple decades in outdoor forest plots. In those experiments artificially doubling CO2 from pre-industrial levels increased trees’ productivity by around 23 percent, according to Norby, who was involved in the trials. For one of the experiments, however, that effect significantly diminished over time due to a nitrogen limitation. That suggests “we cannot assume the CO2 fertilization effect will persist indefinitely,” Norby says. They also found that doubling CO2 only increases plant mass by 23%. Even if we levelled off CO2 per capita emissions, even still then doubling the population would require doubling plant mass. This shows that waving CO2 fertilisation caused by human emissions does not produce a net benefit. At best it does not provide enough food benefit to acount for increased human CO2. Notice how denialists never give sources from reputable refereed journals for their statements or when they do, like Neville, the source contradicts their claims. A very good summary Don and I would agree that there isn’t much to worry about. Amazing that their best response is the Paris BS and fr-ud agreement. Thanks Dr Hansen for his quote. These extremists are happy to waste trillions $ for a zero return , so what is their real agenda? The Concordia Uni study shows that OZ is responsible for 0.006 c of warming since the Ind Rev, so I don’t know why we’ve signed up to this Paris lunacy anyhow. Even chief Scientist Dr Finkel ( under oath) knows that we could stop total co2 emissions tomorrow and nothing would change at all. Of course when you ask the donkeys to tell us how we could/should mitigate their CAGW delusion they just walk away. They betray their so called concern by refusing to even attempt a sensible answer. I wonder why? Why don’t you deal with substantial climate issues using properly sourced and interpreted science instead of scrambling around with unreferenced quips you may have become infected with from visiting some denialist blog? GDP is a measure of MARKET economic activity, NOT climate change. Those who use terms like ‘denier’, are usually alarmists and deniers themselves – i.e. they deny the relevant facts. I suggest you avoid the pejorative comments, and ask questions instead. The data I posted is from one of the world’s most highly regarded climate economists, Professor Richard Tol. The source of the data is here: https://dataverse.harvard.edu/dataset.xhtml?persistentId=hdl:1902.1/15573. I could go into the impact projections up to +3C and +4C GMST, but I feel it would not be appropriate for this thread – far too much to explain. Thanks, and this shows why denialists spread stuff without proper references. You must have deliberately cut out Tols actual comment. Tol’s position is the opposite to your amputated presentation. Let science fill in the gaps. I gave the data for last century, not projections for the future and not one of the millions of comments Richard Tol and others have made. The data clearly shows that warming during the last century was beneficial overall for all the main impact sectors. That is empirical data. I could go onto discussing the the FUND projections, but given your comments so far I can see that a rational discussion with you would not be impossible. You do not understand your own comment. Scientists do not live in the past. Economists know that the past does not predict the future. By all means produce FUND projections, instead of plying the trick of implying there is some source to your comments so far. Others may be interested. But, shock horror, you will need to provide suitable references. If the messurd empirical data differ from the model forecadts, unless it csn be demonstrated that there is a problem with the measurements, it is the models that are wrong, not the measured data. We can progress to discussing the evidence that global warming from 15C to 18C GMST would be beneficial, if and only if you agree to participate in a rational discussion on this topic and answer the few questions I will pose first to ensure we have a common understanding of the relevant background which is necessary for this discussion. If you will not participate in a rational debate and are not willing to answer these questions, there is no point proceeding. Q1: Do you accept that, if global warming is net beneficial (i.e. the positive impacts exceed the negative impacts globally), then we should not implement policies that reduce or slow global warming? ‘Yes’ or ‘no’ answer required to this question. If global warming is “net beneficial” then obviously we can just enjoy the benefits. Global warming is not net beneficial as I explained to you earlier. So you now have a task. Given that “in the long run the negative impacts dominate the positive ones” then should we implement policies that reduce or slow global warming? You have not answered Q1. Just answer the question, with a yes or no. You should have worked out that the answer was ‘yes’. Good. That’s the correct answer to Q1. Now we can proceed to Q2 (below). But please avoid the snarks. That does not make for a rational discussion. Q2. What are the key impact sectors? Absolutely, thanks Don for a great summary. The long (a continually getting longer) list of failed predictions are strong evidence the earlier models were running far too hot. Some of these include: no snow on the snowies by 2010 (revised to 2020 in 2012) and Jindabyne will be a ghost town and its lake bone dry; we have 5 years to save the planet the then Chief Scientist publicly said in early 2009; within 100 months there will a major tipping point (the 100 months ended 31 Dec 2016); there will be 50 million Pacific climate refugeess by 2010 – there was 1 who claomed to be just that – is case was dismissed in an Auckland court; in a few years there will be flooding in downtown of the world’s coastal cities and capitals- several years later, NOTHING. Yes, CO2 is an IR absorbing gas – so what. The discoverer of the IR absorbing properties of many gases, John Tyndall FRS said at paragraph 13 of his REDE lecture “On Radiation” on Tuesday May 16 1865 that CO2 is “one of the feeblest absorbers” of what he called the calorific rays. The strongest by far was H2O vapour (at chapter 14). And the average atmospheric concentration of H2O vapour is much higher than a paltry 405 ppm. The science has been settled since that 1865 lecture. My humble view on climate sensitivity is 1.2 C +/- 0.3 C per doubling of CO2. This places me in a calm, luke-warmist position.It also just touches the lower IPCC AAR 5 estimate. Nothing to panic, nothing much to see here. More good than harm. Remember always, life thrives in warmth, struggles in cold. To the Chrises and other hard warmists on this site, you have 2 choices. 1-worry, must do something, be miserable, emotive, panicky about the future or 2- be and stay calm and happy about the weather. Understand there are, and will always be, doomsters, catastrophists and “the end of world is nigh” folk – so far they have always, ALWAYS turned out to be wrong. Whatever happens will happen – there is nothing you can do about it. But at least on option 2 you will enjoy the time given to you. As an ex – alarmist I saw the light and went with option 2. I advise you to do the same. Current forcing is around 2 watts and will double when CO2 reaches 600 ppm. But there will be massive cumulative damage if forcing stays at 2 watts. Thanks for a very rational summary and outlook, Don. Considering there has been no warming in excess of Nat Var following the longest cool period in civilisation’s history, the Karolys of this world have yet to show how any extra CO2 is a problem but if they at least pushed for a similar global effort and expenditure on serious CO2-free energy such as fission or fusion, as at least James Hansen did, they might have some credibility. Yet more proof that Wind energy is a disaster and must be backed up by reliable gas, coal or nuclear energy. We can only hope that this hurts these S&W con merchants so they are more reluctant to start up more of these farms in the future. But will Aust learn this lesson before we squander even more taxpayer $ on this fra-d? This is another reason to worry about clueless wind energy when a heatwave strikes. Don, until we clean up the language of this debate, we won’t get anywhere. The alarmists redefined the problem from ‘global warming’ to ‘climate change’ because it wasn’t warming. I cannot think of anything more ridiculous than debating climate change. Now I only wonder what word they will use when we have a cooling phase. The same criticism goes for the language around ‘ocean acidity’. It is a nonsense. When the pH of ocean water changes from say 8.1 to 7.8 it simply becomes less alkaline. pH 7.0 is neutral. No fluid can be called ‘acidic’ unless it has a pH of 6.9 or less and as far as I know pH 7.8 is the lowest pH that I have seen for sea water. What you call “nonsense” is precisely exact measured science. Acidification is a movement in a direction on the pH scale and is not related to being below 7.0.
taken up by marine organisms, most if it combines with water to form carbonic acid. Do you have any evidence where, in the total history of the earth, the oceans have ever been lower than pH 7.7? Where they have ever been in an acidic state? Even during atmospheric CO2 levels of 7,000 ppm.? Chris, my comment was about nomenclature, not causes or consequences. It was about having a sensible debate using appropriate language. Are you saying that a car that is decelerating is starting to reverse? Get real. The concept of a “precisely exact measured” world wide oceanic pH is as ludicruous as the concept of a “precisely exact measured” world wide temperature. It is precise to at least two significant figures. Are you saying that oceanic pH is identical to at least two significant figures, worldwide? Absolutely no variation whatsoever? You are in fantasy land if you are saying that. As soon as people use the word “denialist” ( Chris Warren to Peter Lang) they immediately label themselves “catastrophic warmists” who are not interested in having a civilised debate. The science of climate change and weather are complex, and I cannot believe that any solution to the debate will be simple and neat! However, empirical evidence does not support the energy projection. With Energy corrected, the total economic impact of all sectors is positive up to about 4?C GMST increase, relative to 1900. Note that empirical data for last century shows the impact of 0.75 C global warming on energy consumption was positive. But when the model projections take over from empirical data from 2000, the projected impacts suddenly turn strongly negative. By 2080, the negative impacts exceed the total impacts of all other sectors (which are positive). But the projected energy impacts are no supported by empirical data. Correction: the projected impacts are from 2000, not from 1900. Meanwhile, when CO2 levels were at 265 ppm, Holocene sea levels were 2 metres higher. “The natural, day-by-day variations in pH of biologically productive areas of the oceans are larger than those that would be caused by doubling CO2 concentrations. Doubling would take a century or more. Conclusion: Marine life depends on CO2, and some fix it as limestone. Over geological time enormous amount of CO2 have been sequestered by living things, so that today there is far more CO2 in limestones than in the atmosphere or ocean. This sequestration of CO2 by living things is far more important than trivial additions to the atmosphere caused by human activity. The ‘carbonate factories’ described here show that carbon dioxide is vital for the production of limestone. Trying to reduce the carbon dioxide content of the ocean by reducing human emissions is not only futile, but it would have harmful consequences for all the carbonate fixing animals and plants in the ocean. Carbon dioxide in seawater does not dissolve coral reefs, but is essential to their survival. Read my last paragraph, have a Bex and good lie down. You can rant and rave and call those who do not agree 130% with you (and other doomsters) as “deniers”. Go ahead and wallow in your doomster scenarios. Just remember all your rants and insults will change absolutely NOTHING to the future weather. Even if 25 million Australians did the same and decided to live in a cave with a couple of solar panels outside for meagre unreliable subsitanceelectricity, it will still have no measurable change to future weather. By the way the Sun radiates 1365 w/sq metre ( about 1000 reaches the ground on a clear day) so 2 w/sqm is 0.2% (is that it? is that the cuse and beginning of the coming catastrophe? 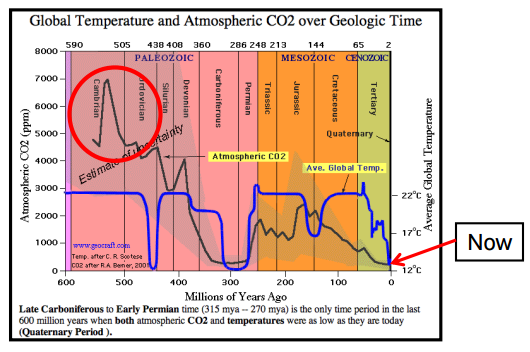 And according to your graph there was zero CO2 forcing pre industrial (at 260-280 ppm) and all the forcing is afterwards (unless it is additional – but it does not say that). My answer to that is BS. Meanwhile I have had a great skiing season – best snow in 14 years (oh that is only weather but one poor skiing year ah ah that is climate change). Anyway I am off to Mt Buller for some great spring skiing. That is strange I definitely remember the prediction around 1990 that withing 20 years there would not be any snow at all. there are heaps of other doomster predictions that have been plain WRONG. But still the doomsters (like you) harp on and on, calling everyone who thinks otherwise (but still agree there is a warming influence) as “deniers”. As an ex alarmist, I shake my head. Yes siree, CAGW is a religion to these people. All the facts can be laid out and they still “believe” and consider those who don’t as “deniers”. I am mystified why there has been no interest here in the proceedings of this conference. There is not point arguing about the science. Alarmism is an ideology. It’s like a religion. It is near impossible to have a rational discussion about it. However, the vast majority of the population welcome rational discussion and information about the impacts of global warming and cooling. If cooling is bad and warming is good, as the empirical evidence suggests, then trying to prevent global warming is doing harm, not good. It makes us more vulnerable to catastrophe if and when the planet cools and slows and reduces warming which prevents us gaining the benefits of warming. The discussion should be about the impacts, not the science. Peter, much of what you say is absolutely true but it has to be continually shown that if alarmists refuse to rationally debate their “science” then it is shown up as the falsity it is. Fake science like fake news needs to be not only shown up but stridently called for what it is. We are currently drowning in it and the plug needs pulling. I recognise the point you are making. However, I feel it is a total waste of time arguing with the died-in-the-wool alarmists. They hold a belief like religious zealots. Their minds cannot be changed. What we should focus on instead is educating the vast majority of the voters who are being scared stiff by the alarmists’ scare mongering. Instead of discussing the science, simply point out that the empirical evidence shows that any global warming we can get in the foreseeable future (e.g. this century) would be beneficial (in total overall for the planet), not harmful and certainly not dangerous. On the other hand, abrupt cooling would be damaging for ecosystems, and humanity. Therefore, in either case increased CO2 concentrations would be beneficial. They would increase warming (beneficial) and reduce or delay cooling (beneficial). You are quite right, particularly with people like our blith who will not only NOT debate, he won’t even answer a simple question other than to put forward religious blither from GCMs. But this does expose their groupthink and their ideology awa their lack of sound intelligence. Asking Chris basic questions and having him avoid them as deliberately as he does, demonstrates this perfectly. They thus devalue their own currency and more people wake to their fanaticism. The “Given” in your question is a premise, not a fact. Please answer my Q2, and then the other questions that will follow so we can get down to testing the veracity of your belief. We need to establish and agree on the basics of the analysis method first. If you will not answer these questions without trying to divert from rational discussion, there is no point in proceeding. The given is based on YOUR OWN source Richard Tol. Tol concluded “in the long run the negative impacts dominate the positive ones”. Are you denying Tol? your own source ????? IF “in the long run the negative impacts dominate the positive ones” then should we implement policies that reduce or slow global warming? Leave out “in the long run” because it is undefined. However, this is not making progress, It is simply the opposite of the Q1 I asked. Why are you avoiding answering Q2? Are you scared you are going to be shown up as wrong? Until you answer Q2 and the others that follow, there is no prospect of conducting a ration discussion. So, I will not respond until you have done so. The long run is the long run. Taking your bat and going home or sticking your head in the sand is not reasonable. “The long run is the long run” is a meaningless answer. And your question (once clarified) cannot be simply answered with an “Yes” or “No” because it depends on the results of cost-benefit analysis. If you will not answer my questions, we cannot have a rational discussion on this matter. I explained at the top why you need to answer them. It appears you are trying to avoid being exposed as not knowing anything about impact analysis. You asked a question and got an answer although it took you a while to realise it. It is unreasonable to ask a question, get your answer, but then not answer yourself. Stop weaving and seeking distractions. Depends on the results of cost-benefit analysis. You breached your own standard – so you have not answered. If costs outweigh benefits then should we implement policies that reduce or slow global warming? It is reasonable for you to just provide a ‘yes’ or ‘no’ answer to just one of these question-forms. Your choice. Do you think it reasonable to ask a question, get an answer, but not answer other folks questions? In none of my comments here did I cite Tol (2018). If you had bothered to read my comments you’d understand I was providing information from the data, not quoting opinions or statements of interpretations Tol or anyone else has made in papers. Do you accept and believe every statement in every document you have ever quoted. I don’t. Your comments on this thread clearly show you are an ideologue, alarmist activist, and certainly not a scientist, at least not an objective, honest one. You have demonstrated you are incapable of rational discussion. You are an excellent example of the worst case of climate alarmist activist, or in your terms, a “denialist”. you breached your own standard – and have not answered. Which question do you intend to answer and when will this be? Don A (the Qld one? ), don’t be too mystified. Cliff Ollier sent this link around quite a few weeks ago and many in our group caught up with the proceedings of this conference well before Don A (the Canberra one) wrote his post. Hi Art, Apologies, when I saw “the Porto Climate Conference 2018 September 7 and 8” I assumed it was quite new, and I missed the previous reviews, comments. I will go hunt. Surely if we can comprehensively, scientifically etc. debunk the CO2 CAGW theory all else will fall in a heap and we can get on with just discussing what to do about natural climate changes, if any. Then build HELE power stations. Dr Macdonald:” The date came back at about 4000 years ago, which was quite spectacular we were very surprised. Narration: 4000 years ago when Narrabeen Man was wondering around this area the sea levels were up to 1.5 metres higher than they are today. Paul: So that spit would have been much narrower. The water levels in the Narrabeen lagoon would also have been higher and it would have acted like a saline estuary. Narration: And there were aspects of the find that aroused Jo’s suspicions: this was no ordinary burial. Dr Macdonald: No certainly it doesn’t appear to be a burial at all”. You only get yourself in trouble citing Drongo droppings. However, as you know, the issue is how to fix climate change particularly as international meetings and government agreements have failed. Land use change may well solve much of the problem. Although our denialists will no doubt claim there is no desertification that is not natural variation (poor fools they) in fact there is a complex interplay between land use and climate change. Stop telling blatant lies, blith. Show us where anyone here has ever claimed that: “there is no desertification that is not natural variation”. At least Allan Savory admits that he made horrendous mistakes before he found the solution. Imagine slaughtering 40,000 elephants unnecessarily before the penny dropped. He also admits he is not an expert on and doesn’t understand climate/CO2 affects. To answer that question we need to know the damages that would be avoided by the proposed mitigation policy and the costs of that policy. But there’s more to it than that. We need to know the probability distribution of the costs of policy achieving its outcomes and the probability distribution of the expected benefits. But there’s more. We also have to weigh the cost and benefits of that policy against the costs and benefits of alternative uses of those funds, such as for world wide health improvements, education, cheap electricity for all peoples, etc. There is just so much that Chris Warren doesn’t understand. But, if he had an open mind (which clearly he doesn’t) and was willing to learn (which he clearly is not), and was prepared to engage in rational discussion (he doesn’t even understand what it is), then he could learn a hell of a lot. By the way, none of this applies to my Q1 because if the answer is “yes”, which clearly it is, there is no cost. He correctly answered Q1, eventually. No progress since then. You asked a question, you got an answer. So it is reasonable that you return the courtesy in the terms you introduced. While I note you have run all sorts of distraction, the question remains. My answer is “yes” – if costs outweigh benefits – then reduce or slow global warming. Other people may have their own answers but are under no obligation to answer. You initiated the question ploy – so you have an obligation. It is not difficult – so you must have a political reason for playing games. I’ve answered your question several times. All it shows is that you have no understanding of the subject. Now answer Q2, and the questions that will follow. Or state that you are not prepared to. “Christopher is an international expert in Responsible Tourism for Accommodation Providers applying technology and creativity to develop innovative sustainable solutions. His services help to save resources, improve competitiveness whilst increasing guests satisfaction, thus making businesses and destinations more sustainable. The innovative techniques are a result of 12 years analysing guest behaviour first hand, drawing on his international marketing career running two successful pioneering companies and sharing his PhD research insights. His inventions and business strategies have established the first carbon audited tourist destination in Australia (winnings of a world Responsible Tourism Award), tourism development methodology ‘Travelology’ and patented intelligent systems for resource management in accommodation. Christopher is an international expert in Responsible Tourism for Accommodation Providers applying technology and creativity to develop innovative sustainable solutions. His services help to save resources, improve competitiveness whilst increasing guests satisfaction, thus making businesses and destinations more sustainable. The innovative techniques are a result of 12 years analysing guest behaviour first hand, drawing on his international marketing career running two successful pioneering companies and sharing his PhD research insights. Christopher is the chairman and founder of Hamlet Research a software development company specialising in behaviour change, My Green Butler, a sustainable tourism ICT brand, and director of the International Centre for Responsible Tourism in Australia and is an UNWTO/UNEP Sustainable Tourism Partner of the 10YFP programme. Clearly he has a commercial interest in pushing his ideological beliefs and in avoiding rational debate that might undermine his commercial interests. Clearly Chris Warren has a commercial interest in promoting his beliefs and in avoiding rational debate that might undermine his commercial interests. That is false and defamatory. The last recourse of all scoundrels. You should simply do what you demanded of others. Your comment applies to all your comments on this site, e.g. calling people who disagree with you “deniers”, avoiding rational debate by using all the tactics of deniers and alarmists yourself, and using many of the ’10 signs of intellectual dishonesty’. You demonstrate you are not an honest scientist. This is false – there is no answer. So are you in fact stating that you are not prepared to answer? This is what you required of others – so now you must offer the same courtesy. So is the answer “yes”? or is the answer “no”? I find it a very easy question to answer and most reasonable people would answer “yes”. If costs will outweigh benefits (as found by Richard Tol) should we reduce or slow global warming? Depending on your answer, there are a lot of future questions I have for you. I’ve answered you here: September 20, 2018 at 6:19 pm Clearly you don’t understand the answer, which means you haven’t a clue. Continually repeating the same question, that firstly is a nonsense question unless the additional information is provided, and secondly has already been answered, is childish. September 20, 2018 at 6:19 pm did not answer “yes” or “no” as required by your own question-format. So is the answer “yes” or “no”. The issue as to whether in the long run the negative impacts dominate the positive ones has been dealt with already by Richard Tol and I assume a much more powerful economist Ross Garnaut would corroborate this – as maybe, so too, the IPCC in its next AR. So is it “yes” OR is it “no”? ‘No’ If the cost of mitigation would exceed the benefits of it. ‘No’, if the funds would deliver more benefits if used for other purposes. Is this simple enough for you to understand. How on earth did you get an PhD, if you haven’t a basic clue about how policies are justified. This thread provides an excellent example of how the climate alarmists behave and how they have managed scared the population with their dishonesty and denialism. You’ll never understand if you are not prepared to engage in rational discussion, and proceed by answering my questions, starting with Q2. But I am convinced you really don’t want to know, perhaps because you might realise you have been misleading your clients all your life..
Stop it Chris. My ribs ate aching with laughter! Congratulations, Peter Lang, for exposing Chris Warren for the ideology-driven fraudster he is. We have been doing it for ages but you have increased the magnification. Those who, for whatever fixed and stupid reason, are determined to totally waste public funds by paying an annual insurance premium that is 1000 times the value of the house, need to be exposed. So much has been distorted by the media about how bad OZ droughts are today, but our rainfall overall is much higher than rainfall in the first 70 ( or say 75 years from 1895) years of the 20 th century. Actually since 1895 because the 5 years to 1900 were mostly in drought as well. Here’s the BOM OZ anomaly set at 8 years, from 1900 to 2017. We can see that overall OZ suffered from much lower rainfall up to 1970, but also from 1895 to 1900. In fact the long positive/neutral IOD ( 1992 to 2009) doesn’t appear to show up much in the BOM total OZ rainfall at all. But NSW is a different pattern with the 1900 ( or 1895) to 1950 period showing a very severe rainfall deficiency. In fact the 8 year line is way below average until 1949. But the P/N IOD deficiency does show up in the NSW data. But clearly this has nothing to do with increases in co2 emissions at all. But where are the media, pollies and scientists telling us about these facts? There plenty of lies and half truths and I’ve found that few people really understand the BOM rainfall data. Here’s NSW anomaly graph. I am stunned that you managed to find and use proper data for once. Yes – Australia is on a long-run trend for increased rainfall, so there must be increased water vapour in the atmosphere independently of cycles. Australia needs more rain but the real problem for farmers is its high variability and unpredictability. This is based on data 1900-2003. Previous versions in the 1980’s were based on stations with 30 years of data. “‘No’ If the cost of mitigation would exceed the benefits of it. Why didn’t you say this hours ago instead of all the other trash you have spread. However you seem to have some problem with expressing yourself. If the cost of mitigation would exceed the benefits of ie mitigation? If the cost of mitigation would exceed the benefits of ie global warming? Why at one point do you use “cost of mitigation” but then change this to just “funds”? Mitigation is not just about funds but lifestyle changes and other non-economic costs and benefits. You may have great funds earning great benefits but at the cost of early deaths for many, but elsewhere you may have the same funds earning less but everyone living longer and happier. Where on earth did you get the false idea I had a PhD. You really are as crazy as they come. Is tourism, particularly international tourism, a significant cause of carbon dioxide emissions? All that international and internal air traval must have some impact. Time to change your professional lifestyle? Shut down the tourism industry? That is a big issue. However I understand that biofuels may protect air travel tourist industry. Ken Stewart looks at the data for trop cyclones and finds that NSW was hit with more cyclones in the past. This BOM data supports what SD has referenced for a long time. A lot of past cyclones listed at this link. Thanks for Ken’s confirmation, Neville. I was catching up with old surfie and sailing cronies at a funeral yesterday and it is interesting to hear the “younger” ones lament about point breaks that were there up until the ’70s but not today, where the broadening beaches have wiped them out. I like to explain to them that prior to those bad cyclones of the 50s, 60s and early 70s the beaches were in similar beautiful condition to today and those point breaks were only there as a result of all the erosion they caused. These “youngsters” have even petitioned council to “restore” these eroded, deep water point breaks because that’s how they thought it had always been. Those cyclones of the cooling period prior to the big Pacific climate shift are not something we would want to experience again. Global warming is mostly a Northern Hemisphere event and the temp change in the Southern Hemisphere plus the % of ocean in the South probably means that cyclones may not yet show an obvious signature for GHG impact. However if you look to the Northern hemisphere – the opposite story unfolds. Remember too, Ken Stewart was one of the folks spreading the Warming Pause false news not so long ago. This is why it is best to stick with authoritative sources. So it isn’t really global? If it is a Northern Hemisphere event, why should we need to take any action? Yes Chris and what happens when the AMO changes back to the cool phase? Usually means more Arctic/Greenland ice recovery and some scientists think the shift started in 2015. See Judith Curry, also the Conversation etc in Sept 2015. But length of phases are highly variable, so who knows? Lomborg also covered this in his book “Cool It” over 10 years ago. Natural (cyclical) AMO effects cancel out in the long run. Explains why sea levels are falling in the SH and rising in the NH. Just shows what true belief can do. Major CAT 3+ landfalling US hurricanes have decreased since the 1930s. This recent graph from Dr Roy Spencer. And the satellite era would have identified much more ACE in much more detail than was ever observed prior. So, realistically, that would point to an even bigger drop in ACE. I wouldn’t be surprised if Spencer’s rate of fall since the ’30s would continue even further back if the same source of detection could be employed. You have committed a major fraud. You cannot insert a linear trend line, if the last data point is not a complete set for a decade to match the previous data points. If you enter the data for complete decades (16) only and obtain a linear trend line, you will see a moderate INCREASE in trend. The mean is 6 and the standard deviation is 2. I don’t know what Spencer claims with this chart – but if he made your comment – he is no scientist. Chris stop your silly ravings, I’ve just quoted what Dr Spencer claimed and Dr Ryan Maue shows global decrease since 1970. See link from SD. You consistently post stuff which contradicts whatever point you are seeking to make. You must take responsibility for what you post. How many times is it now? You should retract this post as it is fake news. There is no point citing anything from Drongo as my blog reading software filters out all its stuff. As I have said before – stick with authoritative sources or at least understand what you are copy-pasting from elsewhere. Spencers other charts are also questionable. He only picked 1930’s because he saw that this was a convenient peak to introduce an artificial (short run) down trend even though it contradicted a rising long term trend. This is so similar to introducing an artificial down trend or pause in temp data by starting at 1998 even though this also contradicted the rising long term trend. This has been explained to you many times in the past, so it seems you are deliberately promulgating all this fraud and fake news. Gosh Chris I think I’ll follow Dr Spencer and Ryan Maue’s data if you don’t mind. You seem to have this habit of shooting your mouth off about the most ridiculous things, so just keep your silly opinions to yourself. And if you can’t understand their data I’m sure they would be happy to explain it to you. In the meantime I’ll leave you to your fantasy world, you seem so at home there. Deliberately following fake data (or deliberate cherry-picking) is the basis of denialism. When you can’t handle inconvenient facts, you just filter ’em out. Do you try that with traffic, too, blith? “One of the benefits of a federation is that each state can learn from the mistakes of others. When it comes to electricity, the disastrous experiment of South Australia, with its uncontrolled promotion of renewable energy, should be a salutary lesson for all the others. Check Dr Spencer’s post about Hurricane’s here and if anyone can’t understand this they should contact Dr Spencer, Dr Maue or Dr Pielke. Just to be clear, here is Dr Spencer’s Hurricane graph by decade showing a downtrend since the 1930s. And he is using US GOV data. Please refrain from blaspheming about Chris’ unalterable faith in the selected sources he follows. “Donald Trump does not get credit for our economic growth, but the media is perfectly willing to blame him for a hurricane,” Morano said. “How does that work? Yes SD we tend to forget how good Morano is at fighting the CAGW dummies. He’s made Nye look stupid on a number of occasions and his claim that these fools believe in a type of witchcraft is very accurate. BTW remember when Bob Brown blamed OZ cyclones on the Coal industry? In reality ( see my previous links to BOM) OZ cyclone activity has decreased since the 1970s and OZ cyclones were much worse in the 19th century than they are today. But none of these facts matter to the groupthinkers as we’ve witnessed here on this blog as on and on they go. I am unable to find the Happer’s chart asserting we need 200 years to double CO2. Happer is a bit of a lobbyist with a long track record. If you can refute one thing Happer has ever claimed about your groupthink religion, blith, please go right ahead. But try using empirical evidence yourself, like he does, and not a gun. Chris according to Tassie Cape Grim co2 levels have increased by 5.6ppm in about the last 2 years and well over 90% of that increase has come from the non OECD. NH levels should be a bit higher than Grim. I’m not sure anyone knows how long before a doubling could occur. If the non OECD quickly changed over to new GEN 4 nuclear stns it would certainly change everything and a doubling wouldn’t take place. Or perhaps the UK may perfect a type of Nuclear fusion generation in the next 10 years, who knows? One particular part of the “Great Debate” that is urgently required in view of the current drought. I urge people who care about our country both economically and environmentally to make a submission. “Historically, the Murray Darling River system during drought experienced salty sea water incursions at least up as far as the Darling junction. This was recorded by Sturt in 1828 when he could not water his horses there. This proves that the river does not flow in drought therefore environmental flows are not natural or necessary during and approaching these periods. Observing this will assist farmers to survive during such difficult times as per the intention of the original development. People in the lower lakes should be prepared to replace fresh water with various degrees of salt water during these drought periods as has been the environmental procedure there for millions of years. There needs to be much closer scrutiny of this crazy proposal that is heading for a country-wrecking fait accompli in the very near future. SD I know that the Darling was too salty to drink during Sturt and Hume’s expedition. In fact even the cattle they had couldn’t drink the Darling water and Hume went out by himself and found a fresh billabong of water and saved the day. Hume was a great bushman and was very experienced when talking to the Aboriginals and always treated them well. The sort of bloke you’d want on an exploration in that very tough country in a time of drought. Thanks, Neville, I didn’t know that particular bit about Hume. I have followed some of his journeys by 4WD and compared his reports with today’s observations. Yes, he was a smart man in the bush. 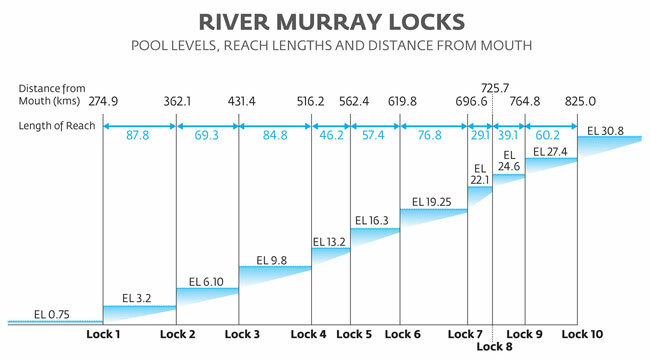 If they simply opened the barrages at Goolwa in dry times the Murray would operate like it has always done forever. Just like so many other Australian rivers. And do the environment, as well as all of us, a far better service. SD here’s Jim Pike writing about the Sturt and Hume exploration in time of drought in 1828. See further into the story for reference to salty Darling and Hume finding fresh water. Sorry above is Ron Pike not Jim. Neville, that Ron Pike summary is brilliant. If only that concept could be finalised! We got half way there and then modern thinking took over and undid all the good work in the name of “environmentalism”. Modern thinking on this problem is half-baked garbage. The current govt is still interested in submissions so we all need to apply the pressure of common sense ASAP. I don’t think Anthony Watts had anything to do with it did he? I believe it was hosted by The Best Schools as part of their Focused Civil Dialogues series. I guess we must both be right. Anthony certainly opened his website to the ‘great debate’, because I gave one of several links. As to your view that the debate originated elsewhere, you may well be right. I’d be surprised if Happer or Karoly have ever posted anything to wattsupwiththat. Heavens! What nit-picking. What I said was correct, WUWT offers the whole of the debate, plus Andy May’s summaries. I think Will Happer has written for WUWT, and you can find out by searching. It’s irrelevant, anyway. I just believe giving credit where credit is due. TBS have a series of these Focus Civilised Dialogues on controversial topics and they’re all a great read. In this one they even went to some effort (and a $5000 prize) to find a replacement after Karoly pulled out. I’d read it long before I saw your Anthony Watts reference. Your opening sentence in this essay suggested to me at least, that Anthony Watts was involved. His entire contribution was to paste it all into his blog. He deserves no more credit for it than you do. Boy this whale would test anyone’s nerve as he jumps out of the water about 15m in front of a small tourist boat. Nothing to do with climate but that’s a lot of tonnes of big mammal having a bit of fun. It’s bad enough when the boat is parked and looking out for a whale. When you are in a serious yacht race, surfing down a steep swell at 20+ knots and one comes up right under your bow….goodnight!!! They are becoming a menace to [little] shipping. I too would be interested in a pointer to that graph if you have it handy; I couldn’t immediately find it. Stacey and Hodgkinson’s rough-n-ready quartic fit to the Mauna Loa data has it hitting 800 ppm in about 2108. Since no one has ever found climate sensitivity alive and in the flesh, so to speak, I stick to the ordinary doubling of one degree for each doubling. But who knows? Presumably that graph would show CO2 level Vs time. If Stacey and Hodgkinson are correct, people being born today have a reasonable chance of being around to witness CO2 levels of 800ppm (setting aside ECS and what that might mean for temperature). I guess you’d better do some of your own work. Are they right? Why do you think so? They’re both respected physicists so I’d like to compare and contrast their arguments. Can you please show us exactly which graph you’re referring to so I can do that? I can’t find it even with your pointer above. Try applying some rationality jimb. We are aware of your concern that: “the science is settled, 97 percent of scientists agree that climate change is real and that humans are the main cause, and the planet will suffer irreparable harm if something is not done immediately. If you do not agree with these claims, you must be a tool of energy companies or of funders of right-wing political causes. The easy default position to take in the face of such claims is to trust the Global Climate Action folks. •whether radically reducing CO2 emissions will improve the climate and human well being. More on the “debate” that the “experts” have been desperate to avoid for many years. There must be something extremely embarrassing in these MBH emails supporting the Hockey Stick for the U of Az to go to the lengths it has to hide them. Why, do you suppose, would they put themselves through all that? Let’s hope ALL the emails have survived? I wouldn’t trust any of these extremists at all and I hope there are very heavy penalties for any fra-dulent behaviour. Could you explain to me how sea water flows uphill as far as the Darling Junction? Does it have some amazing anti gravity property? Like much in this space it is an inaccurate misunderstanding for facts and consequent erroneous conclusions. I suggest the Darling and the Murray were at times and still are subject to elevated salinity due to “lack of water” to dilute the natural salt content. Also as anyone who has any experience with land clearing in dry areas and irrigation will tell you there is an ongoing problem with salt incursion. Tell us all stueyluv, from your own knowledge and experience, exactly how far upstream sea water would travel up a [barrage-free] lower Murray, taking into account your detailed knowledge of sea levels driven by constant strong onshore winds in the GA Bight at the Murray Mouth area during a Highest Astronomical Tide period. And do you think it is possible for the river to be salty and undrinkable right beside an unconnected billabong that is fresh and drinkable, as per Neville’s account of Hume’s finding, if it was entirely caused by local salt content? Well to kept simple consider that the elevation of the river at the confluence of the Darling and Murray rivers is 35 metres. What’s the level of the BOTTOM of the river bed? And then proceed to answer the rest of the question. There are ten weirs from the mouth to Wentworth, each has a head rise of between 2.5 and 3.7 metres. Along each section of the river the average depth is around 2.5 metres. And at Wentworth the river is till not deep. So you are suggesting that in the 19th century, pre the weirs, the bottom of the river at Wentworth was below sea level, so that water could flow all that way. Why did they bother to build the weirs? Think about it. It looks as though sea surge in drought would only get around 300 kilometres upstream but the main fact in the argument still remains; the Murray does not flow in drought and dumping water that is sorely needed by our country’s food providers for “environmental” purposes, is entirely unnatural and wrong. BTW, stu, I fell into the trap of assuming that the Mallee Trench was similar to other parts of similar appearance, even further inland, SA, that are only very slightly above and even below sea level. Did the drongo really say anything as stupid as sea water going up as far as the Darling Junction. There was salty water there but as everyone knows there is massive local salination there anyway. The local source is “salty groundwater aquifers”. It is not due to anything drongo may have said. Neville got himself in hot water citing something the drongo may have posted, so it is best to filter out anything that comes from this individual. Yes he did, surely you are not surprised. Poor ol’ blith wants to filter out my posts but is busting to comment on them. Sea level rise is accelerating – probably due to switch in Antarctic conditions and worsening of Arctic conditions. Poor ol’ deluded blith is still quoting true-believer-fabricated satellite altimetry. Consisting of the same assumption-based GIGO, and similarly exaggerative, as his other favs; GCMs. He is in complete denial of long term empirical SL measurement such as Fort Dennison whose tide gauge, when adjusted for vertical movement, shows virtually nothing happening for a century. He wouldn’t know science if it bit him. It looks like the same urgers/extremists are AGAIN trying to pressure the IPCC to play their deceptive game. Why don’t these fools just look at the IEA site and do the maths themselves? It all hinges on the non OECD countries and if they can’t understand the data they should ask adults to decipher it for them. But of course they would rather have OECD waste trillions of $ on this fra-d for a guaranteed zero return. OH and also throw in an extra 100 BN $ per year to dictators and bleaters all paid for by the same OECD. The Parker et al SL study shows no acceleration of SLR along the Indian coastline and in the longest data bases there is some deceleration. The SAT data is suspect because it is too short and they don’t make proper allowance for el nino/la nina adjustment. Certainly in the longest tidal gauge data from around the world there is little dangerous SLR. In Aust the SLs are 0.65 mm year at Port Jackson and less at Brisbane. Yet during the much warmer HOL optimum SLs were much higher around the world and 1.5 m higher at Sydney just 4,000 years ago. The 2007 Calvo et al study has found a drop in SST across southern Aust over the last 6,500 years. This matches Antarctic data over the same period. You’ll note also that SE Aust has been cooling over the last 6,500 years., matching the SST. Here’s the link and abstract. Comparison of ice cores from Greenland and Antarctica shows an asynchronous two?step warming at these high latitudes during the Last Termination. However, the question whether this asynchrony extends to lower latitudes is unclear mainly due to the scarcity of paleorecords from the Southern Hemisphere. New data from a marine core collected off South Australia (?36°S) allows a detailed reconstruction of sea?surface temperatures over the Last Termination. This confirms the existence of an Antarctic?type deglacial pattern and shows no indication of cooling associated with the Northern Hemisphere YD event. The SST record also provides a new comparison with the more extensive paleoclimatic data available from continental Australia. This shows a strong climatic link between onshore and offshore records for Australia and to Southern Hemisphere paleorecords. We also show a progressive SST drop over the last ?6.5 kyr not seen before for the Australian region. Congratulations for finally citing a worthy, authoritative source. Modern global warming linked to industrial CO2 emissions probably only started around 1850 but only became clearly observable after emerging from natural variations after World War II and only scientifically corroborated by data collected after 1979 although we have some useful data going back to 1900. You will see the trend from 1900 is 0.9 per century. If you download the data you will see the later trend from 1970 has increased to 1.25C per century. You cannot use trends from before 683 years ago as this predates periods such as the Thames freezing over and other historic climate events in the Northern Hemisphere. Chris, the Calvo et al team still infer that they are talking about our modern era and not some period over 600 years BP. Also De Deckker is part of the study and he has data from crater lakes across southern Aust that end at our present era and this was a focus of ABC’s 1,000 year drought program in 2007. His data shows a gradual reduction in rainfall over 5,000+ years and he remarks that our present drought( then 2007 and ended in 2010) could have some decades to run. He is talking about the present day. We now know about the IOD (and the very long neutral/positive 1992 to 2009) and the drought ended in 2010. Here’s that ABC program and in the video you can pause the graph at our present day showing the very low rainfall. The warming since 1970 is a good thing for Aust and the MDB and let’s hope we don’t go back to those terrible years from 1900 to 1950 again. Will the IPCC deliver a surprise on OCT 8th, with a special report of 1.5 c warming? I’ll believe this when it happens and not before. The Green’s clueless Bandt and his silly wife are promoting the Coal Kills nonsense as seen here in Canberra. Must be a huge surprise for the Chinese who now have a life expectancy of 76 or just 5 years behind wealthy western countries. Do these donkeys ever check the data and evidence before they tell their stupid lies to the electorate? Just forty years ago the life expectancy in China would have been 20 years less than today. And China uses the most extreme percentage of coal . Today 67% of China’s TOTAL energy is generated by so called dirty coal and the USA just 17.1%. Only the clueless Green’s can get away with this level of stupidity while the media ,scientists and journos turn a blind eye. As usual this discussion has evolved from the reasonably tight bounds set by the article from Don, to a somewhat less rigorous and locally focussed argument. What I refer to is the tendency to see the whole issue in terms of what happens in our corner of the world. Supposed benefits of increasing temperatures etc relate to here and ignore the impacts of warming on the Arctic region which is acknowledged to be the thermostat for the worlds climate system (at least by respected publishing climate scientists). Evidence indicates that the rapidly changing albedo of the Tundra and the Arctic ocean is having significant negative effects on world climate. And what is causing that? In similar vein are the common tropes (common to the main right wing influenced democracies where this is a hot topic) that one degree of warming is insignificant, that the reason power prices are high is renewable energy, that coal is clean, that the “alarmists” have changed from global warming to climate change because of the supposed pause etc. (IPCC was called that in 1988 by the way). The recent northern hemisphere summer has presented some extreme events, the jet streams appear stalled, temperatures have been extreme in many places. As usual this could just be weather but trend lines (the indicator of climate) continue rising. Hurricanes may be less in number in USA but their power and consequences are much greater. Our coming summer may be interesting to watch. Meantime as they say coal is clean, water is not wet. Meantime cost of power from renewable sources keeps falling, cost of construction of coal plants rises. It will be interesting to watch the unfolding of Palmers new power station in the Galilee basin. Accepted estimates put the cost of a coal plant at above $2billion and six years to build. Brave man if he is serious even on top of his coal pile. Big transmission losses from way up there also, another argument I am sure. Stu here is the abstract of the MacDonald et al study that found much greater warmer in the Arctic during the Hol optimum. In fact temps were from 2 to 7 C warmer than today and boreal forests grew up to the Arctic coastline for thousands of years. And there are a number of PR studies that show earlier 20th century Arctic warming that is similar to recent warming since 1995. Here’s MacDonald et al study link. forest development in this region commenced by 10,000 yr B.P. summer insolation, cooling arctic waters, and neoglaciation”. © 2000 University of Washington. Not to mention those 80-odd peer reviewed papers I posted up-thread showing sea levels being ~ 2 metres higher during that period. Also, Neville, where they keep their thermometers at the poles these days, they somehow always manage to place them beside a well swept asphalt runway. The AMO could have reached its peak and we may see a slow trend to lower Arctic temps and perhaps some ice recovery in the next 10 years. But only time will tell. Each denialist stands on the shoulder of another. Geeezzzz Chris I see your comments are back to there usual standard. BTW which one of those gents is you and which one is stu? Ah yes the noted place for science papers, Practical Science and the Daily Mercury! Being charitable it only quotes anecdotal evidence from that time based on observations on the periphery of the arctic and is hardly a scientific paper. It is a guest article by Florence Fetterer, principal investigator at the National Snow and Ice Data Centre (NSIDC) in the US. “Sea ice cover in the Arctic has undergone a widely reported decline in recent decades. 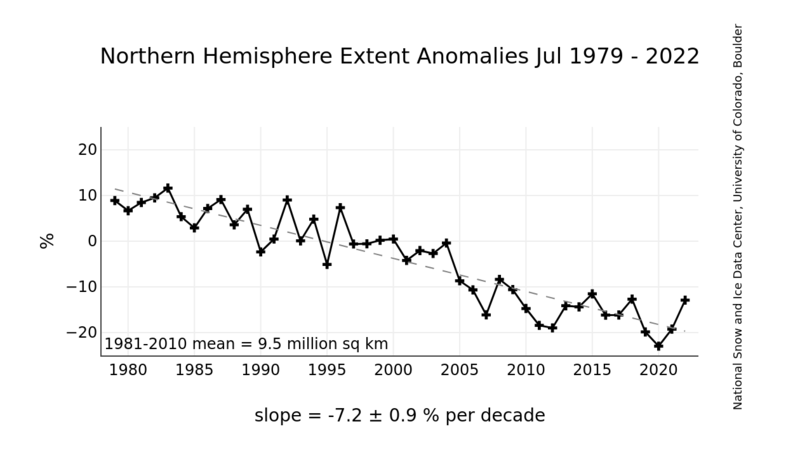 The decrease has been greatest during summer, with sea ice extent reducing by around 12% per decade since the satellite record began in 1979. You will find plenty of data in the article. Stu I know you’re a true blue warmist but the scientists involved in the MacDonald et al study come from all over the world. Here’s the list from the study and compared to your silly nonsense they are a very elite team. BTW I know you precious petals don’t like PR data and evidence so I’ll keep them coming just for you. Stu doesn’t get that the obvious fact that sailing ships that couldn’t go to windward managed to traverse the Arctic for centuries. Many of the hot shot, auxiliary engined, windward machines of today can’t do that even with ice-breaker support. But the truth is, the data that stu quotes is incredibly flawed. Here’s the Box et al study of Greenland temps from 1840 to 2007, showing a much greater earlier 20th century trend than the recent temp trend. Co2 levels then perhaps 300 ppm and now above 400 ppm. Box, J.E., Yang, L., Bromwich, D.H. and Bai, L.-S. 2009. Greenland ice sheet surface air temperature variability: 1840-2007. Journal of Climate 22: 4029-4049. The near-surface air temperature history that Box et al. derived for Greenland is reproduced in the figure below, along with the corresponding history of Northern Hemispheric near-surface air temperature. Figure 1. Low-pass-filtered Greenland and Northern Hemispheric near-surface air temperature anomalies with respect to the 1951-1980 base period vs. time. Adapted from Box et al. (2009). In spite of all the fuss climate alarmists make about Greenland being on the verge of crossing a tipping point and beginning to experience dramatic ice loss, the results of Box et al. demonstrate there is nothing unusual, unnatural or unprecedented about the nature of its 1994-2007 warming episode. In fact, it is much less impressive than the 1919-1932 warming; and it becomes even more “less impressive” when it is realized that the atmosphere’s CO2 concentration only rose by about 5 ppm during the earlier period of stronger warming but by fully 25 ppm (five times more) during the later period of weaker warming. If you actually read the science rather than just abstracts and Watts cherry picking etc you will find lots of qualifications to avoid mistaking correlation with causation etc. So what that CO2 was much less then, check the qualifications regarding lags and leads. we will know soon enough but some including you may already be at the wrong end of the age curve and will miss having to issue a mea culpa. Well then stu tell us how to fix your CAGW problem? You’re like Chris, all yap and no bite. Come on surprise us all, tell us how you’ll convince the non OECD? You do not understand your own post. When there is natural variation, the underlying warming can only seen by comparing “trough-to-trough” and “peak-to-peak”. On this basis the warming (to 2006) is clear. You have just repeated all your previous errors based on your misuse of 1998 (a peak) as a starting point to explore global (non peak) temperature trends. The warming in Greenland, though fluctuating widely, is now equal or greater than any time in the human past. The point is that the natural causes generating past warming episodes do not exist today and if it was not for industrial CO2 we would be trending into another ice age. So according to your logic Chris we should be heading for an ice age? But because we’ve forced everything we are heading for more warming? Amazing stuff this co2, we’ve added another 1 part to 10,000 parts of air ( 100 ppm) and then suddenly no more ice age problems to worry about. And you really believe this delusional nonsense? Your problem is that there is nothing unusual or unprecedented about modern warming. Greenland has warmed at this rate before early last century as my PR links show. Yes I am aware of claims not so long ago, based on natural tendencies, that we were due to trend into a cooler period. These natural tendencies were counteracted by GHGs. In this context – even if our temperatures merely leveled off – this would still be a scientific signature for global warming. Bed-wetter blith thinks that when the PDO arrived in the late ’70s and the cooling ended, that was the start of all our troubles. I wonder what happened to the logarithmic effect of all that early ACO2? And still the penny doesn’t drop. The blitherers are totally immune to observations. If Vikings grew barley in Greenland and they buried their dead in churchyards, the bodies now encased in permafrost, that is not likely. 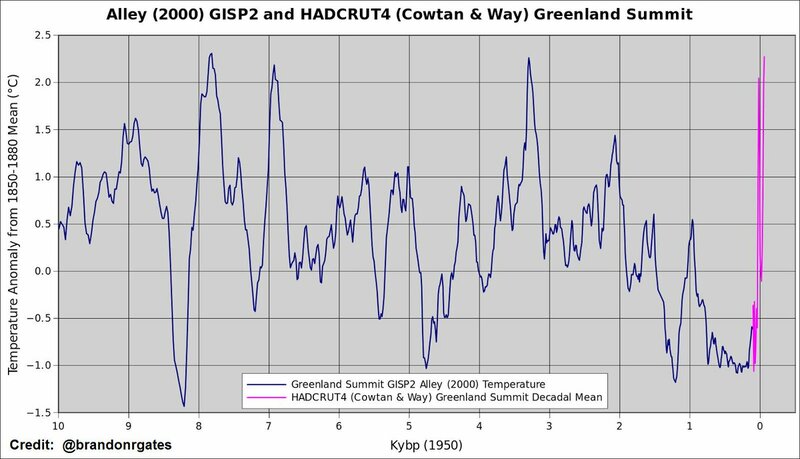 And your graph on Greenland warming is plainly ridiculous. Here’s the 2006 Vinther et al study with the combined Greenland data-sets using actual instrumental data from early 1800s to 2000. UK alarmists Dr Jones and Dr Briffa were also part of this study. The last couple of decades up to 2000 were cooler than the 1910s, 1920s,1930s, 1940s and 1950s and they compare well with some of the much earlier decades. See Table 8 and their conclusions. Even their BBC extremists are waking up to China. It looks like China’s construction of new Coal fired power stns is surging ahead and the new increase may be the size of the existing plants in the USA. That would be an increase of 25%. “IPCC AR2 WG1 page 137 states that satellite sea ice observations began in 1973. This is also stated in IPCC AR1 WG1 page 224 with a graph in the upper right of that page. 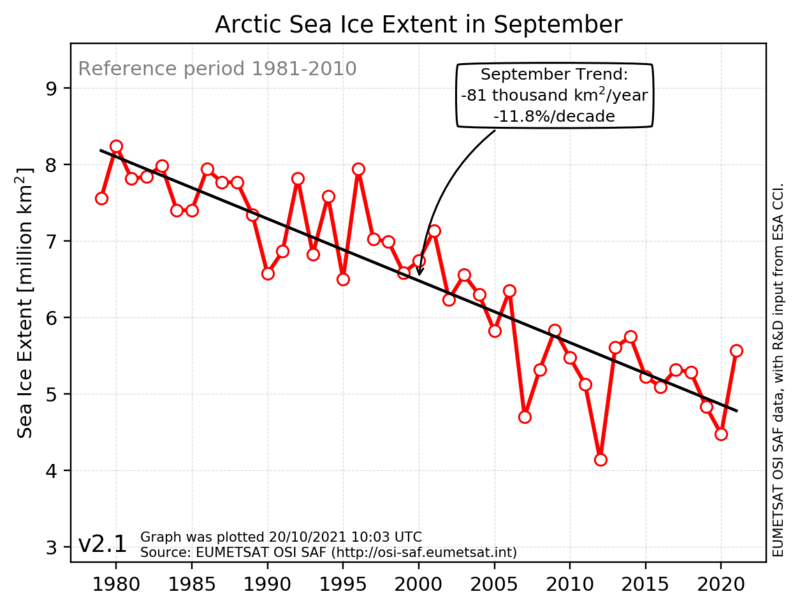 1979 is now used as the starting point because it is a maximum for sea ice extent. I am not sure that focussing just on Greenland helps you. Greenland ice sheet is loosing ice at about 200 GT per year, and the Arctic and Antarctica generally are also loosing ice. It appears, if this chart is correct, that the Northern Hemisphere is loosing sea-ice at a rate of some 10% per decade ????. Bloody hell, I my have got something wrong! All I can say is that 10% decline is defined for “Northern Hemisphere” while 11.7% decline is defined for “Arctic” and is specific for September (the usual annual minimum). The trend for March (the usual maximum, is 2% decline). Chris the 2017 Stein et al study found that we now have the largest sea ice extent for the last 10,000 years. The LIA was higher and the 1970s was also at a recent high point. Have a look at the graph from the Stein study at this link. I don’t think we have much to worry about and the AMO warm phase could change to cool at any time. Neville, when you are in denial of the evidence that the early Holocene was ~ 4c warmer with seas ~ 2m higher than the present yet CO2 was ~280 ppm, it’s not hard to fool yourself that anything your little heart desires is taking place. The easiest fool to fool is yourself. If you look through the comments via your link you will see that Scientific American published contrary evidence from a guest blogger. 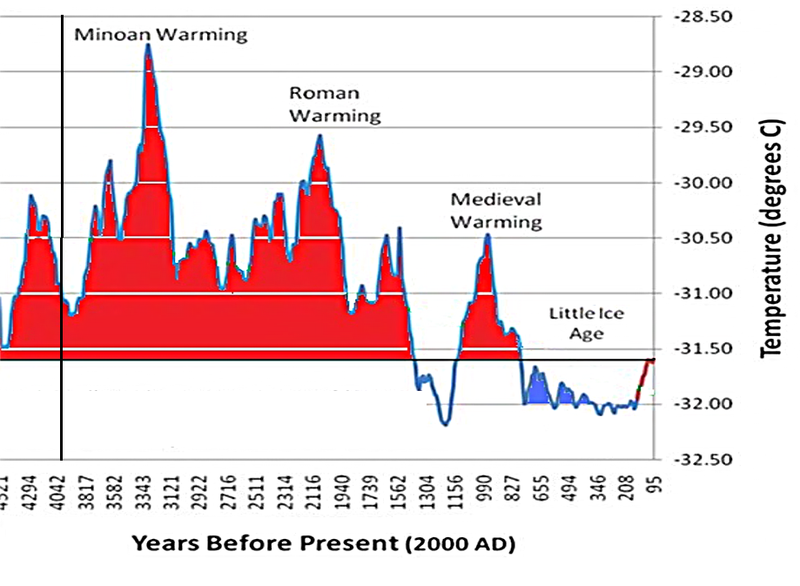 The Scientific American chart (citing Naam) is preferable, as it is corroborated by trends in global land ice (glaciers). Going back 10,000 years does not help understanding events that are only visible (beyond natural changes) since the 1980’s. Around this time, it was still considered that the Earth was entering a cooling phase. It looks like the paper by Stein may well be nicotine-science. It looks like the samples he used from his cores were not fine enough to report on conditions since the motor car was invented. You can’t work out that natural changes of up to 4c warmer, higher SLs and less ice are far greater than any of your less-than-1c natural changes of today, blith? They destroy your argument that anything unusual is happening. The world has seen it all long before current AGW theory. Chris here’s the AMO index and you’ll note that it changed to warm phase at the same time as the PDO changed from cool to warm as well. That date is 1976 and when the AMO changes to cool we should see sea ice return to higher levels. Just a conjunction of two and all part of a natural change in the climate. But you should understand that the earlier Holocene was much warmer than today with much higher sea levels around the world. The Arctic, Greenland and Antarctica have been much warmer in the past but the LIA is a stand out because it was a very cold period and thankfully we have a warmer world today where 7.3 bn people live much longer, healthier and wealthier lives than at any time in human history. The scientific explanation for the long-run trend is either orbital changes or atmospheric changes. Jim Steele: As illustrated between the 1960s and 1990s, Greenland typically gained more than 500 Gt/yr and the IPCC deemed Greenland’s ice mass was stable or slightly increasing with no contribution to rising sea level. However, between the late 1990s and 2012, correlating with less clouds, more solar heating and the negative North Atlantic Oscillation (NAO), Greenland did not accumulate enough surface ice to balance glacial discharge. That triggered global warming alarmists’ worst fears. But as natural oscillations would predict, there would be no runaway melting. Greenland has now cycled back to gaining ice the last few years. In addition to the NAO’s effect on cloudiness, I had predicted that the NAO’s effect on warm intruding currents reaching Greenland’s shores would soon reverse and we should expect Greenland to gain ice by 2015. I was off by only one year. On this sort of evidence one would think a debate is well justified. More wonderful news, let’s hope they don’t go to water on us. Aust will freeze it’s funding to the Paris COP 21 Green Climate Fund and let’s hope the con merchants, bludgers and fra-dsters go and get a real job for a change. For the last few years Dr Hansen has told the world that S&W energy is just BS and fra-d, so why isn’t anyone listening? More recent number crunching in Germany has found that Wind is indeed just BS and fra-d and will always have to be backed up by Fossil fuels or Nuclear power stns. Gosh big surprise NOT and Solar is even more of a joke. And Germany has tried for decades to change to S&W yet now still have a much heavier Co2 based percentage than the much hated USA. The USA changed over to more Gas and now coal generates just 17.1% of TOTAL energy and Germany generates about 25% and much of that from expanding Brown coal mines. Yet we here in OZ are following this lunacy at very great risk and cost to our energy reliability. OH and Labor and the Greens want even more of our energy to come from this S&W madness and there’s 100% rock solid guarantee that none of this will make the slightest difference to the climate in 30 years or 100 years. Just ask the non OECD countries or Chief scientist Dr Finkel, or Dr Hansen or Lomborg’s team that have thoroughly researched the maths and data to support their claims. Yet the faithfull cultists still insist we do something? Another well informed article by Lawrence Solomon on this S@W lunacy that the world is increasingly turning its back on. But will Aussies wake up before we waste even more billions $ on this idiocy? Certainly all subsidies for the S&W nonsense should be withdrawn immediately and we should hope that Labor and the Greens fail in their bid to win the next election. Simulated stratospheric temperatures over the period 1979–2016 in models from the Chemistry?Climate Model Initiative are compared with recently updated and extended satellite data sets. The multimodel mean global temperature trends over 1979–2005 are ?0.88 ± 0.23, ?0.70 ± 0.16, and ?0.50 ± 0.12 K/decade for the Stratospheric Sounding Unit (SSU) channels 3 (~40–50 km), 2 (~35–45 km), and 1 (~25–35 km), respectively (with 95% confidence intervals). These are within the uncertainty bounds of the observed temperature trends from two reprocessed SSU data sets. In the lower stratosphere, the multimodel mean trend in global temperature for the Microwave Sounding Unit channel 4 (~13–22 km) is ?0.25 ± 0.12 K/decade over 1979–2005, consistent with observed estimates from three versions of this satellite record. The models and an extended satellite data set comprised of SSU with the Advanced Microwave Sounding Unit?A show weaker global stratospheric cooling over 1998–2016 compared to the period of intensive ozone depletion (1979–1997). This is due to the reduction in ozone?induced cooling from the slowdown of ozone trends and the onset of ozone recovery since the late 1990s. In summary, the results show much better consistency between simulated and satellite?observed stratospheric temperature trends than was reported by Thompson et al. (2012, https://doi.org/10.1038/nature11579) for the previous versions of the SSU record and chemistry?climate models. 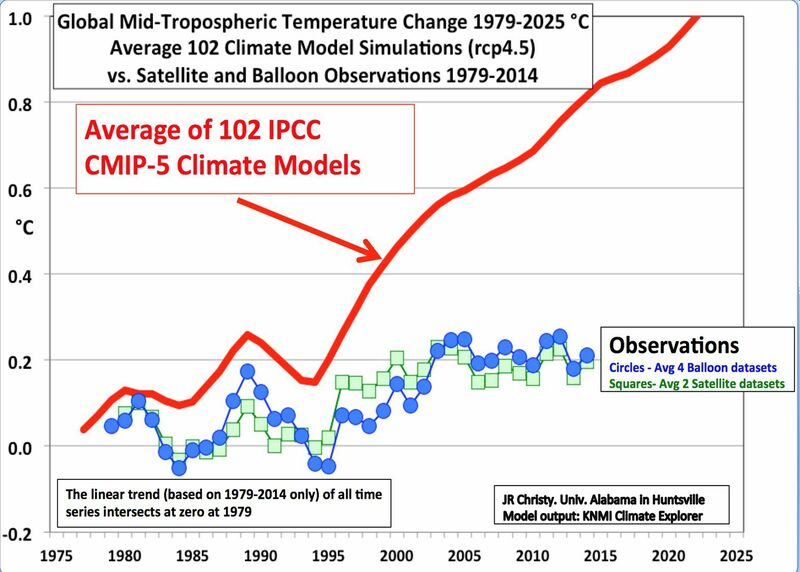 The improved agreement mainly comes from updates to the satellite records; the range of stratospheric temperature trends over 1979–2005 simulated in Chemistry?Climate Model Initiative models is comparable to the previous generation of chemistry?climate models. Germany has tried for decades to meet their delusional obligations to reduce co2 emissions. But they are now above their emission targets and have to pay billions $ in penalties to appease the Green Gods of the EU. To get to this disastrous position has cost them 100s of billions $ in S&W subsidies and decades of harm to business and domestic users of this clueless Green energy fra-d. And not a scrap of difference to temp by 2040 or 2100. But after this stupid waste of time and money they now generate perhaps 2.3% of their energy from S&W and the world average is just 0.8%. Yet they still cannot meet their co2 reduction targets. How stupid is that and why should OZ follow this madness? Certainly we should look forward to 100 years of pain for no gain. The failure to meet European Union climate targets will cost Germany billions. According to a report, the German deficit means the government will have to buy CO2 certificates from Eastern Europe for two billion euros. While Germany is missing its climate target by just under three percent, countries such as Bulgaria, Croatia, Slovakia and Hungary are doing significantly better, according to a report by Wirtschaftswoche. Meanwhile, China goes gangbusters. This increase alone is about 10 times our total. 259 Gigawatts (GW) of new capacity are under development in China, comparable to the entire U.S. coal fleet (266 GW). This represents a 25% increase in China’s coal power fleet. If we kept all our FF industries and jobs here we could reduce the net world emissions. Thanks to Steve Kates at the Cat. A “small” part of the Great Debate that alarmists deny. Typical believing, bed-wetters blither about the “driest EVAHHH” unprecedentedness of the weather [except for a time before high ACO2 levels]. Can you believe such alarmist, lying reporting? However other centres probably would have had similar records, but measurements were affected by the increased cloud cover – another sign of global warming. Yes, blith, hot or cold, everything’s a sign of Glowball Warming. Why would we have the driest September on record now? So what happens if it gets worse??? September/October is the driest period in Australia anyway so if there was a drier April [which usually gets twice as much rain as September] in 1902 you aren’t saying anything. Bit of a comprehension problem there, hey, blith? “Below average rainfall covered almost the entire country” last month, Dr Trewin, senior climatologist at the Bureau of Meteorology, said, adding that it pipped 1957 as the driest September, and trailed only April 1902 as the driest for any month. That seems some what at odds with all published data including National Geographic saying that “Germany is a leader. Last year about 27% of its electricity came from renewable sources such as wind and solar power…” Other sources I have checked come up with the same kind of data. As usual I am somewhat suspicious of the low figure promulgated by groups such as GWPF who have known links to fossil fuel entities. Latest [cooling] global temps for September. Stu I don’t know how many times I’ve posted these IEA links, but here they are AGAIN. You’ll note that Germany generates just 3.5% of their TOTAL energy from GEO + S&W and 78.7% from fossil fuels, 7.7% nuclear, 0.5% hydro and 9.6% BIO + waste. Reminder, this is the TOTAL energy mix to run Germany, not just electricity. I’ve linked to the most impeccable source available, the EU based IEA who audit the world country by country every year. BTW add in BIO + waste ( emits co2) and FFs + bio + waste = 88.3%. Simple maths + data, but most countries can’t understand it at all. Here’s LOMBORG”S IEA update to 2018, but we’ve found out since that China has had a big increase in coal fired stns that even the BBC is waking up to. Chris you seem to have trouble understanding very simple graphs. Here’s BOM’s OZ rainfall anomaly graph set at 15 years and you’ll note that it is below average rainfall from 1900 to 1970. Set it at 8 years and above average is just 3 brief points and of course much more rainfall since 1970s. Here’s NSW and same terrible rainfall and way below average until 1949. This is set at 15 years, but 8 years is the same. Don’t forget that starting 5 years back to 1895 yields the same result and adds in another 5 years to that miserable time period. Note that the long pos/neutral result for IOD is shown in NSW but not in OZ overall. IOW we now know what caused the long MILL drought as shown by UNSW team study I’ve linked to before a number of times. I have no problem reading graphs. I have no problem reading BOM statements. I have no problem staying on topic. If you access the appropriate data – ie on topic – for September you will see this is correct. There is no point diving into any amount of other data to construct denialist distractions. Neville, and our blith is convinced that a dry month that goes against the trend is definitely a reason for increased enuresis. Every little helps, according to our blith. BTW, blith, what are you doing trying to engage and enlarge on my topic? I posted the above before you did and I thought you were totally avoiding my comments. That’s OK. I’ll let it go this time. Gezzzz Chris, my point was that A dry month is irrelevant and of course is just weather and 55 years and 75 years of lousy rainfall is something that apparently nobody wants to talk about. In fact most pollies, the media and the Flannery type donkeys don’t seem to be aware of the OZ rainfall record at all. A dry month is irrelevant. A record dry month is not, particularly when other sites are getting massive rains. You have to be a little wet behind the ears [not to mention wet behind other places] to believe these BoM “records”. Not only has the whole system changed regarding the places where rainfall is recorded today compared with historically, it has also changed from manual recordings to automatic weather stations. In our area a number of residents have historically provided maps of monthly rainfall for the district that is published in the local rag. A recently introduced BoM AWS just up the road from me regularly records around 30% less rainfall than I do when people next door to it record about 10% more than I do. It is so unreliable that the other day when it was raining and this station was simply not recording anything, I drove over to where it is to make sure it was actually raining there. Sure enough it was. Just that this AWS was not recording it. With a few AWSs like that it is easy to set the driest EVAHHH record. Particularly in a national drought that we are currently experiencing. If these AWSs are this inaccurate on rainfall, they don’t invoke much confidence in guaranteeing the accuracy of the much smaller amount of warming. Yet the believing bed-wetters genuflect to them. Here is a good video from the BOM about the IOD. Don’t forget this was officially “discovered” in 2009, just before the 2010/ 11 floods when La nina + neg IOD caused very bad flooding over parts of eastern OZ. Thanks for that link SD, I think Walter was one of the first persons that started me down my road of healthy scepticism of their CAGW extremism. But I was also raised by parents who viewed everything with a pinch of salt, so I consider myself to be well armed and very doubtful of both old and new religious fanaticism. Yes, he’s one of the smart academics, Neville. Remember when the Maldives only had 30 years to remain above the seas? But today they’ve just opened a new airport and have a bustling tourist industry and SLs are about the same as 1988. OH and their drinking water could dry up by 1992. Unbelievable idiocy by the alarmists, but true. More dopey dud predictions, but who cares? And still more extremist garbage from these clueless donkeys to tell us how to live and what to eat, all this in a new 400 page report, no less. And no measurable change to temp at all, just ask China, India and the rapidly developing non OECD countries. That dopey Bill McKibben thinks that the earth will boil unless we do SOMETHING. So why didn’t it all end when co2 levels were 1000 ppm, 4,000 ppm or even 7,000 ppm? I mean this was no small window of opportunity, because the various periods of much higher co2 levels lasted for hundreds of millions of years. After this long natural experiment we now have co2 levels of about 406 ppm and temp trend of about 0.55 c per century since the coldest period over the last 10,000 years. See HAD 4 data since 1850. Concordia UNI study also concludes OZ is responsible for a whopping 0.006 c degrees of warming since the start of the Ind. Rev. So what’s the problem? Alarmists, please explain what is wrong with this graph. NOAA Tornado data shows that the US is heading for another low number compared to their record keeping over the last 65 years. Another dud prediction broken by Gore and his fellow alarmists. But will the pollies and media comment or even notice? The Trudeau donkey is running into more problems trying to convince Canadians that they should wreck their country by introducing industry destroying co2 taxes. Let’s hope he fights this up to the next election. Like the silly fool in NZ this bloke doesn’t seem to be able to add up simple sums. Dr Hansen was the head of NASA GISS for many years and was one of the two advisers to Gore when he was researching his AIT book and movie. The other expert used by Gore was Dr Pearman of the CSIRO. Bill McKibben and Hansen both agree in a target of 350 ppm for co2 and McKibben’s site is called 350.org. But they also share a belief that the earth’s oceans will boil if we don’t soon reduce emissions back to 350 ppm. Here’s Hansen a few years ago making this claim of boiling oceans, yet he ignores the fact that this experiment has run that test of time over the last 600 million years and we still have our oceans. And Co2 levels were much higher ( 1,000 to 7,000 ppm) over that long period of time and today a number of scientists doubt that we could double co2 levels even if we tried to do so. Certainly to double levels to 800 + ppm would take a long time and the non OECD alone would probably find this to be an impossibility. Here’s Hansen making his boiling oceans claim at 2 mins. What do others think about the possibility of this strange claim? When CO2 levels were high there was no runaway greenhouse event. Hansen is saying IF there is a runaway greenhouse event then the oceans could boil. You are trying to impute some other context into his presentation to graft your political agenda onto it. Whether the oceans will boil depends on many factors, and the unlikelihood of clouds surviving in a hot upper atmosphere. In the Hansen video he also talks about Snowball earth with ice to the equator at about 650 mil YBP. But co2 levels were about 7,000 ppm at that time, and you would think that the much higher levels of co2 would cancel out any chance of such an extreme cold climate ? 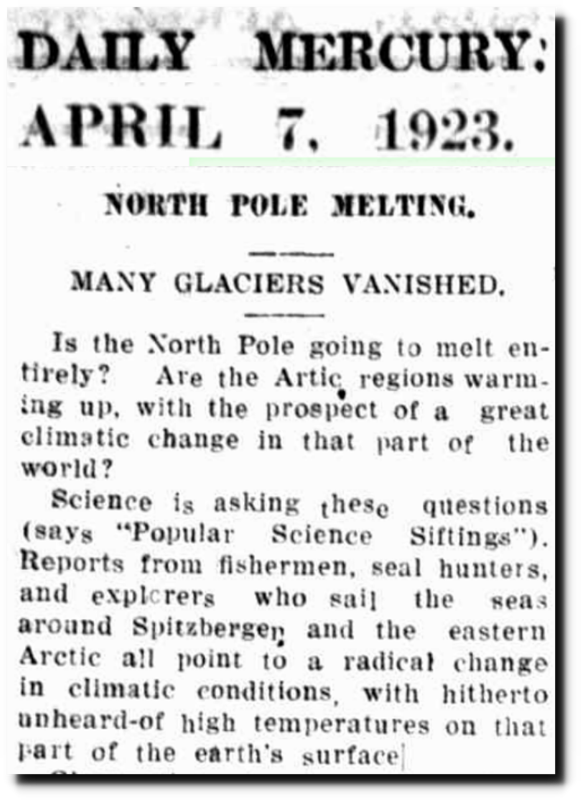 But Hansen also believes that it’s possible to melt the ice sheets in less than a hundred years? Does anyone seriously believe this is possible? See video. Why switch attention to ancient snowball earth when the sun was not as strong as today and without considering Milankovitch cycles? The question really is, if upper atmosphere temps increase so that clouds diminish, and CO2 increases, and water vapour increases, does the modern value for solar radiation (watts per sq metre) provide enough energy to warm ice to 0C and then overcome latent heat of fusion. You want to contest Hansen, but you do not have the knowledge or skills to research the question. You only rely on what ill-digested scraps you can copy paste from denialist websites. SD I don’t get the OZ, so is this good news or have they gone bat crazy stupid about SLs AGAIN? Also what do you think about Hansen’s boiling seas video? I think this is totally bizarre and proves that they have lost a grip on reality, but Chris and his co2 pixie dust theory thinks I’m unfair. Give me strength. It just proves how long some people will hold fast to their fanatical religious faith. Neville, I’ve been trying to post a longish reply but the site won’t accept it. “NSW Environment Minister Gab­rielle Upton has dodged a direction by a Land and Environment Court judge to defend her decision to rezone two beaches as being at “immediate and intolerable risk of erosion”, with a hearing set for yesterday morning called off at the last minute to allow mediation. Early last month, NSW Land and Environment Court judge Terry Sheahan delivered an extraordinary rebuke to Ms Upton. “In essence, and crucially, the applicant (the residents) argues that the evidence before the minister, and the advice given to her, was that these two beaches were ‘stable’ and ‘in balance’ so her finding was not supported by logical or rational grounds,” he said. “I accept the submissions of the applicant (the residents) on each aspect of this dispute … and reject those of the minister who has so far failed to identify for the court, as required by the Civil Procedure Act, the matters she genuinely ­disputes,” he said. IOW, there is nothing happening WRT SLR except bed-wetters bed-wetting as our own resident enuresist blith is doing and then claiming that whinnying jimmy actually knows what he is talking about. Jimmy should have whispered in Al’s ear that if warming causes CO2 and then CO2 also causes even more warming then maybe that would cause a runaway greenhouse effect and we wouldn’t even be here if that really were the case. Hansen actually understood that but who deals in scientific facts when they’re selling snake oil? And tell blith to check the times when the earth was both hot and cold with both low and high CO2 levels. But blith is sure that jimmy has it right this time and our current below Nat Var temps will be the end of us. Thanks for that SD, boy some of these pollies actually believe they know as much as the people who’ve lived on the beaches for a very long time. I know Labor are clueless but even the NSW coalition govt can’t be trusted when it comes to their SLR and changes to sand dunes etc. Chris doesn’t make a lot of sense, so what’s changed? If the oceans didn’t boil over the last 600 million years with 5 to 16 times the levels of todays co2 then we haven’t got anything to worry about. And the Antarctic ice sheet somehow managed to establish its permanence about 35 MYBP and is still going strong. Pleased to hear you admit it, stueyluv. But don’t let that prevent you from producing some first-time evidence for your rigid belief. Even non-worthwhiles can get lucky sometimes. So tell us stu, how do we reduce co2 levels back to 350ppm like Hansen and McKibben keep telling us about? This was the co2 level in 1990 and since then the OECD have flatlined and the non OECD have soared until we have our present level of about 406 ppm. Chris has stumbled at his attempts to provide a clear and rational answer to this question, so come on be the first to tell us how this could be done. But we’ve got plenty of data to challenge you should you make an attempt. It’s incredible to think that the very people who claim to care the most about their so called CAGW run away and hide at the first opportunity. So come on prove me wrong and in turn also prove that Hansen’s claim of BS and fr-ud is also wrong. See his Guardian interview in 2015. At least now it is easier for people to grasp the extent of corruption in the greatest deception in history. In the Judge Kavanaugh affair we have just witnessed how far the SJW Left will go to lie, deceive and delude to promote their cause. It is interesting that the same group with their left wing supporters are the promoters of AGW and that with the aid of their financiers they will go to any lengths for their religion. If John McClean is correct this could be the most important development since Climategate. And Datagate has a nice sound to it. Time will tell. More delusional nonsense from their IPCC , we must hold temp increase to no more than 1.5 C.
So how do they suggest we accomplish this and what new source of energy should we use? We know that S&W is just BS and fr-ud and can they tell us how much of the warming since the I. Rev is due to humans? IOW, they reckon just 1c more of warming will wipe out coral. The only thing they have proved scientifically is how completely unscientific they really are. Yes SD and our fly in fly out religious fanatics just run for cover when they’re asked the difficult questions. They’ve got plenty of con tricks to try and fool dummies but when they’re asked to answer the most fundamental questions they vanish into thin air. Like how will their so called mitigation help to reduce emissions by 2040 or 2100+ and how much would the temp drop over that time? Also what energy source would they use and please no S&W BS and fra-d? And how much of the Concordia Unis 0.7 c of warming over the last 200 years is due to humans? Of course any sensible country would need to know this before they committed even more endless bns $ on the S&W deception for a guaranteed zero return. Just ask the Germans. Dr Curry has a quick response to the latest IPCC BS and fra-d.
Another accurate post from Chris Booker, exposing more of the mitigation BS and fra-d. In 2010 China stated that they would double co2 emissions by 2030 and India stated they would treble them. Trump is the only leader who has had the brains to leave this cesspool of lies, fra-d and deception. Evidently no other leader can add up simple first grade sums. The BBC and The Guardian recently reported on new satellite pictures revealing that China, as easily the world’s largest emitter of CO2, is now busily building so many new coal-fired stations that they will add 259 gigawatts or 25 per cent to its coal-fired output, more than that of all US coal-fired power stations combined. This “approaching tsunami” of new coal plants is “wildly out of line” with the 2015 Paris climate agreement, reports The Guardian, quoting a report from the research group Coalswarm. But in no way should this be a surprise. It is just what China announced it intended to do at the time of Paris, when it said it would be doubling its CO2 emissions by 2030. Official Chinese figures confirm that the country is well on target, having increased its emissions by 6.9 per cent in the first quarter of 2018 alone. What makes this much odder, however, is that The Guardian itself was already reporting as long ago as 2010 that China planned a massive expansion of its coal-fired power generation. Odder still is that The Guardian also revealed that the UN was planning to pour “billions of pounds of public money” in subsidies to China and India, to enable them to build 20 “heavily-polluting coal plants”. This was to be done under the UN’s “Clean Development Mechanism” scheme, designed to subsidise “developing” countries like China and India to rely only on “sustainable development” as their economies caught up with the West. The idea was that these countries would be given “carbon credits”, which could then be sold to organisations in the West, to allow them to “offset” their own CO2 emissions. To earn these credits, the developing countries had to show that on specific projects they were curbing their emissions: as when they replaced a “dirty” old coal plant with a new one using less polluting “clean coal” technology. By 2010 this system had thrown up so many scandals, including wholesale fraud, that it came under heavy fire, and in some more blatant respects it was modified. But the UN ruled that China and India could still earn carbon credits for closing “dirty” power plants to replace them with “more efficient” new ones. In fact the real message was that China and India never had any intention of reducing their dependence on coal, as they had both made abundantly clear in documents each country submitted before the Paris agreement, where China said it planned to double its CO2 emissions by 2030, and India that it would treble them. This was precisely the reason given by President Trump in 2017 for pulling the US out of the “Paris accord”, which he regarded as no more than a cynical charade. But The Guardianand the BBC never mentioned any of this. If they had followed the story properly, they would have no reason for now expressing shock at what China and India are up to because they would have known it all along”. Dr Richard Lindzen has just delivered his lecture to the GWPF. Here is his last line and his conclusion. “Misrepresentation, exaggeration, cherry picking, or outright lying pretty much covers all the so-called evidence”. More stunts from the latest PAGES 2K 2017 update. Steve McIntyre has found more problems since he forced the 2013 withdrawal of their first study. Here is his summary and thanks go to Steve for pursuing these clueless fools. The eight PAGES2017 series are summarized in a consistent panel plot below for the period 1000 on. The tree ring component of this network is, more or less, a reductio ad absurdum of tree ring chronologies as useful temperature proxues: only four of 63 original tree chronologies have sufficient Hockey Stick-ness to be retained in the network, with even these poor remnants reverting to the mean in the 21st century updates. There is negligible similarity between the three lake sediment series, each of which uses a different indicator, though similar measurements appear to have been taken for all three sites. The only series with a meaningful HS (Chepical) appears to result from construction of a dam in 1885AD, rather than from increased temperature. This leaves the Quelccaya ice core series – which was a staple of temperature reconstructions as early as 1998 and, which, ironically, was used upside down in PAGES2K (2013), corrected in PAGES 2017 without disclosure/admission of the earlier error. All in all, a rather pathetic show by PAGES2K. Here is the link to Steve’s forensic appraisal of their still flawed study. And scores of so called scientists were involved in this nonsensical rubbish. Even Origin and AGL admit that the more dumb energy we install the more chaos we create for our electricity grid. But our looney pollies are only too happy to wreck our grid across every state in the country. Of course not a scrap of difference to temps in 30 years or 100 years, just so long as our industries and families suffer when the blackouts the occur. Will the finality of “great debate” on climate be the icing on the cake? A bakery run by a Christian family in Northern Ireland on Wednesday won a landmark case in Britain’s highest court over its refusal to make a cake decorated with the words “Support Gay Marriage”.